One of the best reasons for hiring Dr. Pipe Drain and Plumbing Services is technology. We embrace using the latest and best technology available in plumbing for your plumbing repairs. For example, when we perform a drain line inspection, we examine pipes using a special camera. This waterproof camera is designed specifically for the plumbing industry. Drain line video can be used to detect current plumbing damage or potential problems before they occur. Your plumbing professional inserts the high-resolution camera directly into the sewer line. The camera’s probe consists of a long flexible rod, able to maneuver through the drain. As the drain line video inspection occurs, the plumbing technician makes real-time assessments. He or she will use the video feed to evaluate the situation in your pipe. The technician will give you the diagnosis of the problem. He or she will follow with recommended solutions. Fixing the problem may range from snaking the pipe to drain replacement. You’ll receive a copy of both the drain inspection video and still photos. 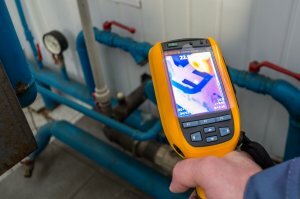 Why have a Drain Line Video Inspection? Using a video inspection has two main benefits. For one, you can see drain problems without the expense and inconvenience of exploratory excavation. There are no open trenches or exposed pipe to work around. The other benefit is that it prevents potential problem before they occur. You can see budding symptoms of drain damage. Then, you and your technician can develop a plan to correct the issue, saving you money. When can Drain Line Video Inspections be used? Obstructed by foreign objects, such as tree roots. During a home inspection. You don’t want surprises when you’re buying your new home in Ottawa. A video inspection of the plumbing will locate future and current problems in the line. You can use this information when negotiating the price. Preventative Maintenance. It may be time for you to perform a routine home inspection anyway. As a responsible home owner, you may inspect your home as the seasons change. This is a good way to proactively approach any new home issues. We recommend that you add a drain video inspection to your seasonal preventative maintenance checklist. Early detection is your best defense against leaks and blockages in your pipes. It’s nearly impossible to recognize the symptoms from the outside of the pipe. Most pipes are obscured by walls, the floor, or the ground. These obstacles make clogs or leaks expensive and inconvenient repairs. When you do see the signs, it’s often too late to prevent damage. A video inspection verifies that the flow through the pipe is as it should be. It also helps the longevity of the pipe to prevent potential damage. Keeping damage contained prevents them from growing into a problem that disrupts your household. Preventing problems means less digging, less mess, and less money. It doesn’t matter if your home is old, new, or renovated. What’s going on in your pipes is usually a mystery. A camera inspection will demystify the situation. For a small fee and a little time, you’ll know exactly what you’re dealing with. If you’re not sure, a Dr. Pipe plumbing professional will be at your side to help. Together, you’ll navigate through the trouble spots and come out with solutions going forward. Why choose Dr. Pipe Drain and Plumbing Services to perform your video inspection? Are fully licensed and insured local professionals. Have over 20 years experience in the plumbing business. Can perform trenchless drain repairs, which can save you time, money and inconvenience. Have competitive prices. We offer a 25% discount on drain inspections if you mention the Dr. Pipe website. Call us today, and let’s schedule your drain line video inspection in Ottawa today!